The Maddock sisters are just like everybody else. They fret about their looks, they daydream about finding the perfect jobs, and they obsess about men. They are small town girls, born and raised in Dark Root, Oregon where they know all their neighbors and nothing ever changes. What sets them apart from everyone else, however, is that they happen to be witches. Here is a brief rundown of the Maddock sisters and their abilities, along with a few other players from the town of Dark Root. Maggie: The Witches of Dark Root is primarily Maggie’s story, told through her point of view. Maggie is a middle daughter, sandwiched between compassionate older sister Merry, and beautiful younger sister Eve. She is also the most magically gifted of the three girls. When she is highly emotional lights turn on and off, radios stop working, and candles topple from shelves. In addition, Maggie has the ability to see things in the dark, things that no one else is able to see, not even her powerful witchy mother. Maggie doesn’t practice the craft; her abilities come naturally. Still, they are reckless and untamed, earning her the nickname wilder, a derogatory word used to describe a witch who cannot control her powers. Merry: Merry is the oldest of the three daughters. She is a kind young woman whose magical abilities lie in healing, empathy, and growth. Able to remove another’s emotional and physical pain by taking it on herself, she is often exploited by others. Too kind to turn anyone away, she relies on Maggie and Eve for emotional strength. Eve: Eve has always been ‘the baby’ and has a hard time sharing the spotlight, even with her sisters.Eve represents the seductively beautiful woman in every community who has no qualms taking what she wants, even if it doesn't belong to her. Eve’s powers lie in potions and charms and she specializes in love and beauty magick. Miss Sasha Shantay: Sasha Shantay is the mother of Maggie, Merry and Eve and the most respected (and feared) person in town. She has been living in Dark Root for as long as anyone can remember and is the keeper of the town’s history. Miss Sasha is also the leader of The Council of Seven, a tribe of local witches who also reside in Dark Root. As leader it is her duty to educate the next generation of witches (her daughters) on everything magick, a duty she takes very seriously. Miss Sasha claims direct lineage to the town’s first witch, Juliana Benbridge, who relocated to Dark Root over a century ago when she was banished from Portland for practicing the craft irresponsibly. The Citizens of Dark Root: While most of Dark Root’s townspeople are not witches,the town is highly accepting of the practice of witchery. In fact, Dark Root has built an entire tourist industry around it, drawing visitors from miles away to see the famous Miss Sasha’s Magick Shoppe and the annual Haunted Dark Root Festival. I hope you enjoyed meeting the witchy citizens of Dark Root. This first book lays the foundation for chronicling over a century of witchcraft in the area. Future books will explore the girls’ witchy powers in more detail and the life of their powerful mother, Miss Sasha. They will also delve deeper into the town’s haunted history. Deep in the forests of Central Oregon is a town called Dark Root, a place shrouded in secrets, mystery, and witchcraft. But for Maggie Maddock, Dark Root is also a prison, a place where she is forced to spend her days working in her mother’s magick shop, forfeiting any dreams of her own. So when a mysterious stranger suddenly appears and offers to take her away from it all, Maggie jumps at the chance. Now, seven years later, a strange phone call sends Maggie back to Dark Root and she is unprepared for what awaits her: a dying town, a sick mother, a renewed sibling rivalry, and a past she had hoped to forget. 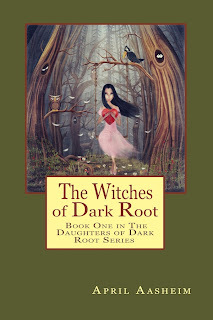 Part Practical Magic, part Divine Secrets of the Ya-Ya Sisterhood, The Witches of Dark Root is a tale that seamlessly weaves the normal with the mystical, the mundane with the fantastic. Zipping in and out of time from Maggie’s childhood as an apprentice witch to current day, where Maggie struggles with her increasing powers, as well as family obligations, The Witches of Dark Root is a book rich in both fantasy and heart which will leave readers believing in magic. April Aasheim spent her childhood traveling the Southwestern portion of the United States with her fortune- telling mother and her get-rich-quick dreaming stepfather. During that time, April and her family toured with a carnival company, sold bug repellant door to door, and resided in an abandoned miner’s shack in The Superstitious Mountains of Arizona. When April became a teenager she went to live with her biological father in California. Her father saw April’s need to express herself and encouraged her to write her stories rather than tell them. By learning to write April was able to make sense of her family and the world she lived in. She continues to do that to this day. 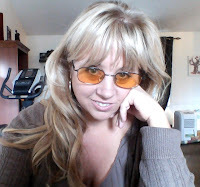 April currently lives in Portland, Oregon with her husband. She is the mother of two incredible sons and the step-mother to a beautiful little girl. She is the author of numerious short stories, has contributed to several anthologies, and is the author of the well-received novel: The Universe is a Very Big Place. The Witches of Dark Root is The first in the Daughters of Dark Root series and April looks forward to writing the second book in 2014.